- The villa Hitu is located in a quiet dead end, near the Jalan Legian, one of the main arteries of Seminyak: shops, spas, restaurants (Made Warung, Ocha Warung ...), supermarket (Bintag) remain easily accessible on foot. - On the ground floor, the open-space (including the living room, the dining room and the kitchen) offers an ideal environment for relaxation with its breathtaking view of the pool and the tropical garden that surrounds it: The room to Eat is furnished with a beautiful and large table d'hôtes that can accommodate up to 10 guests. The kitchen is equipped with a gas stove with oven, microwave, coffee maker, toaster, blinder, cutlery, crockery and glassware. - For lovers of sunbathing, large and comfortable chairs are arranged on both sides of the pool. For those who prefer pampering, a massage table is available upstairs for in-home spa sessions. 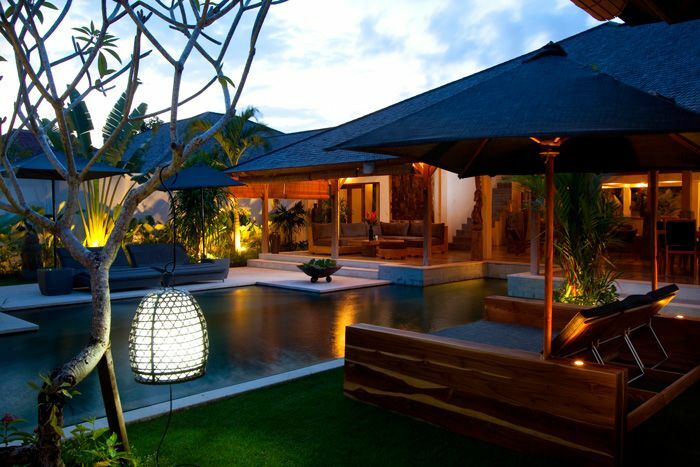 - Villa Hitu has 3 suites of 50m2 each and 2 bedrooms. It can accommodate up to 10 people (extra bed on request only). - 2 main suites are located on both sides of the living area. The third suite is located in the guest-house. All are equipped with a comfortable king-size bed, a safe and air conditioning. They have a dressing room and a private bathroom and offer lovely garden views and direct access to the pool..
- Our 2 managers GATOT and LORENZO, will be at the villa to welcome you and ensure that you are perfectly installed. Do not hesitate to ask them if you need help during your stay (organization of excursions, scooter rental, babysitting, home massage etc ...), for any technical problem or any problem. medical emergency. They speak ENGLISH and FRENCH. - For your comfort and tranquility, our 2 ladies MELAN & KOMANG will be at the villa between 08:00 and 16:00. They will serve you the breakfasts and will take care of the household tasks in all discretion. - GEDE our gardener will take care of the maintenance of green spaces daily. - Pick-up offered on arrival for a stay of 5 nights or more. For bookings of less than 5 nights, this transfer can be arranged upon request (IDR 200,000 per car). - First breakfast offered for a stay of 5 nights or more. - Please note that all our prices include 10% local Indonesian tax and 11% service charge. - Taxis are easy to find in our neighborhood. However, we suggest our customers to use the taxi company "Blue Bird". - Arrival time: 14h00 / Departure time: 12h00. Please note that late check-out until 18:00 will be charged an additional 50% of the nightly rate. Late check-out after 18:00 will be charged an additional charge at the cost of one night. - Although there are house staff present, please respect the cleanliness of the premises. - The client is responsible for the damages caused to the villa during his stay. This includes damage caused by outside guests being invited to the villa. - Out of respect for our neighborhood, we urge you to significantly reduce noise after midnight. - Please turn off the air conditioning when you leave the villa, and keep the doors closed when it is running! - Water is a precious asset, thank you for helping us to conserve the vital resources of the earth: our standard is to change the towels every three days during your stay. If you wish however that they be changed earlier, we will do it gladly. - Keep in mind that the safety of children is solely the responsibility of the parents. Our family of 9 had a great time at the Villa Hitu!! The pool was definitely the highlight, we all enjoyed it especially after doing a lot of walking around the Seminyak area. The beach is a 10-15 minute walk, food is a 5 minute walk as well as the shopping. So it is in a great location!! The bedrooms are very large, the bedding was comfortable, and the villa decor was beautiful. Overall, it was a great place to start our trip to Bali. The house is really amazing: great layout, wonderful decoration. Staff was on site from 9am to 5pm, very discreet and helpful. Location is very central, walking distance to the Beach (+/-15'). Quiet, yet conveniently located near Bintang Supermarket, a very good bar/restaurant and a pizza place. Would have been perfect if it were a little closer to the beach, but it's still walking distance. Fantastic villa! Looks exactly like the photos. Staff were very helpful and provided all information to help your every need. Would highly recommend and would love to go back! Beneden zijn 3 mooie slaapkamers met eigen badkamers. Boven zijn 2 slaapkamers met niet erg grote bedden met een badkamer zonder toilet. Het ontbijt is aan te raden personeel erg vriendelijk we konden de was laten doen. Zwembad en tuin werden goed bijgehouden. Service is erg goed. Strand is dichtbij, winkels en restaurants ook. Direct access from the airport on the expressway. Close to renowned restaurants of Oberoi neighborhood. Located in the heart of the vibrant Seminyak area while being very quiet and safe. The KuDeTa and tasty cocktails facing the sunset. Famous restaurants, Le Métis, La Sardine, SIP, The Living Room, The Pearl, Ultimo, Cafe Bali, Junction ... are close to the Villa Hitu. In 30 minutes you will also find the beautiful white sandy beaches of Nusa Dua, the cliffs and the temple of Uluwatu, also renowned for its surfing, the traditional village of Ubud and its many art galleries. At 1:30 boat you can reach the islands of Gili and Lombok.